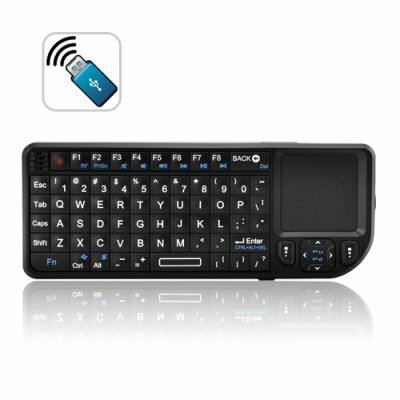 Successfully Added 2.4G Wireless Mini Keyboard with Touchpad + Laser Pointer to your Shopping Cart. Enjoy full wireless control of your PC with our most advanced mini wireless keyboard to date, the K130. The K130 works on (RF) radio frequencies so it can be used in any location and without having to point it at your PC for it to work. And best of all it’s a simple “plug & play” device that requires no software or driver installation at all. Just plug the wireless receiver into any USB port and you’re ready to go. When finished the USB receiver conveniently slides back into the keyboard until the next time you’re ready to use it. And as an added bonus there’s even a built-in laser pointer for delivering more effective presentations, lectures or sales meetings. Why spend $150 or more on a brand name wireless mini keyboard with touchpad when you can own one that’s the same quality, direct from the factory, and at a fraction of the cost? Take advantage of our unbeatable wholesale price and order your K130 mini wireless keyboard today while supplies last. And remember, all products from Chinavasion are in stock now and come with our hassle-free full 12 month warranty. This great product is available with a no MOQ (minimum order quantity) for a limited time only. After 60 days, it will only be available with an MOQ of 2 units, so be sure to order your samples right away! on 2011-09-19 17:03:29 Excellent ! Un petit clavier très pratique pour du Home Theater PC !!! De la taille d'une télécommande, la portée est très correcte (+ de 10m), rétro éclairé, une longue autonomie de batterie (intégrée) Assez solide et bien fini ! Parfait ! on 2011-08-08 15:10:55 Excellent product. Perfect for the management of HTPC. Built-in laser pointer is perfect for managing my cat. I get it in two weeks. on 2010-12-07 22:02:36 Really cool. works like i thought. i got it fast, it works perfect! just like i thought it would. the mouse pad works like a laptop. and i love it. thanks chinavasion!